The Florida Keys Memorial, known locally as the “Hurricane Monument,” was built to honor hundreds of American veterans and local citizens who perished in the “Great Hurricane” on Labor Day, September 2, 1935. Islamorada sustained winds of 200 miles per hour and a barometer reading of 26.36 inches for many hours on that fateful holiday; most local buildings and the Florida East Coast Railway were destroyed by what remains the most savage hurricane on record. Hundreds of World War I veterans who had been camped in the Matecumbe area while working on the construction of U.S. Highway One for the Works Progress Administration (WPA) were killed. In 1937 the cremated remains of approximately 300 people were placed within the tiled crypt in front of the monument. The monument is composed of native keystone, and its striking frieze depicts coconut palm trees bending before the force of hurricane winds while the waters from an angry sea lap at the bottom of their trunks. Monument construction was funded by the WPA and regional veterans’ associations. Over the years the Hurricane Monument has been cared for by local veterans, hurricane survivors, and descendants of the victims. At the time, the Florida East Coast Railway was the primary route through the Keys although the veterans mentioned above were working to build what is now U.S. 1. They were hired for this project in an effort to employ members of the “Bonus Army” that had marched on Washington in 1932. They lived in tents on Matecumbe and as the storm strengthened, a train was sent to evacuate them and others living in the area. The rescue train arrived just as the hurricane reached its peak strength. A tidal wave hit the train, knocking all but the locomotive off the tracks. Many drowned inside the cars. 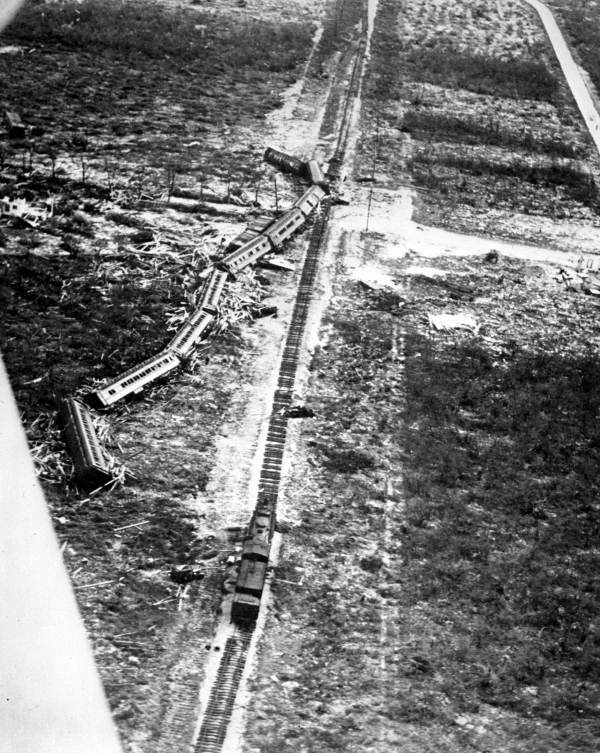 Rescue train swept off the tracks by the 1935 Labor Day hurricane. Courtesy of the State Library and Archives of Florida, on Flickr. This hurricane was the first of three category 5 storms to hit the United States in the 20th century (Camille in 1969 and Andrew in 1992) and still holds the record as the only U.S. storm with a central pressure below 900 mbar. Bodies from this storm were found as far away as Flamingo on Florida’s southwest coast. Heat and the large number of casualties forced the need for cremation and a central burial site. This was the end of the “overseas railroad”. The railroad never rebuilt the track destroyed by the storm. The highway was completed and is still the only road into and out of the Keys. Evacuating the Keys when storms threaten continues to challenge Florida’s emergency operations system. The memory of those hundreds who died 75 years ago remind us all what a hurricane can do.